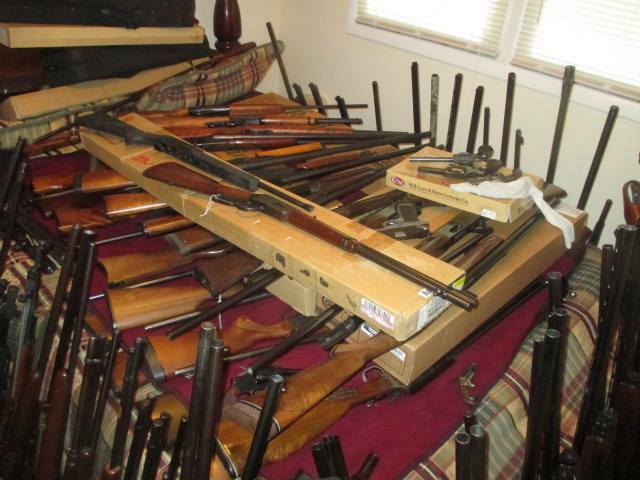 over 500 lots including guns, ammo, cases, holsters, etc. the auction site the morning of the auction for preview. paperwork done on this many guns. 2. Antique firearms will be sold directly to any buyer with proper ID. estate will also deliver your guns to a local FFl to begin the process. purchases of buyers who do not have acceptable credentials. 5. Terms of auction. Cash, cashiers check, money order or check. 10% BP. auction. We will sell in order by provided list. stolen over the past 40 years will be refunded to the buyer. 19. HL121029606516	Chancan	12 ga.
26. B037623	Stevens	94	20 ga.
30. 833874	Zastava	Mark 5X	300 Win Mag. 61. 938606	Smith & Wesson	38 Cal. 62. D142862	Smith & Wesson 10-5	38 Cal. 64. J21531	Dakota	SA Army	357 Mag. 71. 7B1238	Smith & Wesson 916A	12 ga.
142. 20765	Western Arms 12 ga.
161. 41498	Ithaca	Hammerless 12 ga.
171. 52284207	Stoeger	Coach gun 12 ga.
245. V188610	Smith & Wesson Victory	38 Spl. 267. PBD3105	Smith & Wesson	SW40VE	40 Cal. TSG2338 Fllipietta Buffalo Hunter 44 Cal. 285. D122211	Stevens	94	12 ga.
290. 611305612999	CVA	Eclipse	50 Cal. 294. 134603	Ruger	Carbine	44 Cal. 300. S&W1028	Smith & Wesson	25	45 Cal. 301. N199702	Smith & Wesson	27	357 Mag. 302. 61K2176	Smith & Wesson	19	357 Mag. 329. T110203DK05738	Verona	SX405T	12 ga.
341. L22728	Franchi	48AL	20 ga.
349. BBJ5822	Smith & Wesson	629	44 Mag. 381. 190837	Thompsoncenter	Hawkan	45 Cal. 417. 5742836	Ruger	Vaquero	45 Cal. 418	5806554	Ruger Vaquero	357 Mag. 419. 5670728	Ruger Vaquero	357 Mag. 432. Box of Ammo	22, 17 HMR, & 25 Auto. 433. Box of Ammo	7 mm Weatherby Mag. 443. Box of Ammo	12 ga.
444. Box of Ammo	12 ga.
445. Box of Ammo	12 ga. & 20 ga.
455. Box of Ammo	410, 12 ga., & 16 ga.
462. Box of Ammo	12 ga.
465. Box of Ammo	20 ga. & 12 ga.
466. Box of Ammo	20 ga.
469. Box of Ammo	357 Sig., 9 mm, & 41 Mag.